The final Jacobite rebellion came to a bloody end at the Battle of Culloden. Having successfully advanced as far south as Derby, Prince Charles Stuart had been pursued north by the forces of the Duke of Cumberland. Resolved to fight, the Prince overruled his Council of War but saw his army butchered when the terrain defused the Highland charge. On 5 November 1688, William of Orange landed an army at Brixham starting a popular uprising against the Catholic James VII (II of England) that resulted in his overthrow. Dubbed the Glorious Revolution William and his wife, Mary Stuart (daughter of James VII), were invited to become joint monarchs subject to constitutional limitations. Protestant England embraced the new monarchs but reaction in Scotland to the new regime was mixed. Although the Scottish Government supported William and Mary, amongst both Protestant and Catholic circles there was reluctance to displace the Stuart dynasty which had ruled Scotland for over 300 years. In April 1689 the first Jacobite rebellion ignited led by John Graham, Viscount Dundee. Supported by Irish troops and Highland clans he had military success at the Battle of Killiecrankie but was killed in the effort. A number of further skirmishes were fought but the uprising was ultimately defused when on 27 August 1691 the Government offered a general amnesty to any clans who had participated in the uprising provided they took an oath of allegiance. The associated massacre of Glencoe in February 1692 did much harm to this attempted reconciliation. William died in 1702 (Mary had died in 1694) and was succeeded by Anne, another daughter of James VII. Her reign saw the Act of Union (1707) merging the Governments of England and Scotland whilst the Act of Settlement (1701) formally barred any Catholic from the throne – both measures were opposed by many Highland clans. So to was the succession in 1714 of the first of the Hanoverian monarchs, George I, whose eligibility came from descent from Elizabeth Stuart, a daughter of James VI. Discontent turned into war in 1715 with a new Jacobite rebellion although this was quickly crushed whilst a third rebellion in 1719 was defeated at the Battle of Glenshiel. Extensive construction of roads and military installations commenced to ensure the Highlands would finally be pacified. By 1744 the Union had seemingly failed to deliver economic benefits to the Highlands and a series of circumstances had put severe pressure on the clan structure. Concurrently war broke out between Britain and France; the latter sought to ignite a new Jacobite rebellion and planned to synchronise that with an invasion of Southern England headed by Prince Charles. But fortunes of war intervened and the French stalled their support. Frustrated by this inaction, Prince Charles fitted out two ships under the pretence of a routine privateering mission. With a frigate called Du Teillay and a man-of-war, the Elisabeth, he sailed for Scotland in early July 1745. The Royal Navy’s HMS Lion intercepted the Elisabeth and compelled it to return to port, but Prince Charles on the Du Teillay pressed on and on 23 July 1745 he landed on Eriskay in the Outer Hebrides. Prince Charles had assumed that Highland support for his cause was still strong but with three previous Jacobite rebellions having been crushed and a road network facilitating easy access for a Government army, few chiefs were ready to support his cause. Only through (false) promises of French support and personally winning over the influential Donald Cameron of Lochiel did he rally any to his cause. By August 1745 though he had announced his intention to repeal the Act of Union and legislate for religious freedom prompting more to join his force. The initial reaction from the Government was muted. Whilst most of the British army was deployed fighting in Flanders, a force of 4,000 soldiers under Sir John Cope was deployed in Scotland to deal with any eventuality. He moved his force into the Highlands but faced a confusing intelligence picture opting to march on Inverness. But his actions left central Scotland undefended and Prince Charles capitalised on the error; on 17 September he entered Edinburgh proclaiming his father James VIII of Scotland. Realising his mistake, Sir John moved his force towards Aberdeen and then, by sea, to Dunbar. He moved his force towards Edinburgh but was defeated at the Battle of Prestonpans on 21 September; his entire army was decimated with over 1,500 soldiers being taken prisoner. The battle awoke London to the threat and prompted the recall of Prince William Augustus, Duke of Cumberland and his army from Flanders. On 1 October Field Marshall George Wade, who had been recalled earlier in September as the situation had deteriorated, was ordered to take position in the north and duly marched to Newcastle in October. On 3 November 1745 the army of Prince Charles invaded England. With Wade at Newcastle the Jacobites invaded via Carlisle ironically benefiting from the road network Wade had built in order to suppress the Highlands in the preceding decades. By 4 December the Prince had reached Derby having skilfully manoeuvred around the armies of both Wade and Cumberland. London lay open to his attack but, for the first time since returning to Britain, Prince Charles failed to convince his Council of War. Led by Lord George Murray, the Jacobite commanders feared being hemmed in by the armies of Wade and Cumberland as well as any force raised within London itself. On 6 December 1745, just two days after their arrival in the city, the Jacobite army retreated from Derby resolved to march north back into Scotland. Arriving at Carlisle Castle the Prince received word that French reinforcements were on the way and left a garrison installed ready for a future advance into England. The bulk of the army continued their retreat north compelling Glasgow to re-provision and equip them before attempting an ineffectual siege of Stirling Castle. The Government’s forces were now in hot pursuit. Within days of the Prince leaving his garrison at Carlisle, the castle had been besieged by Cumberland and was forced to surrender without terms. 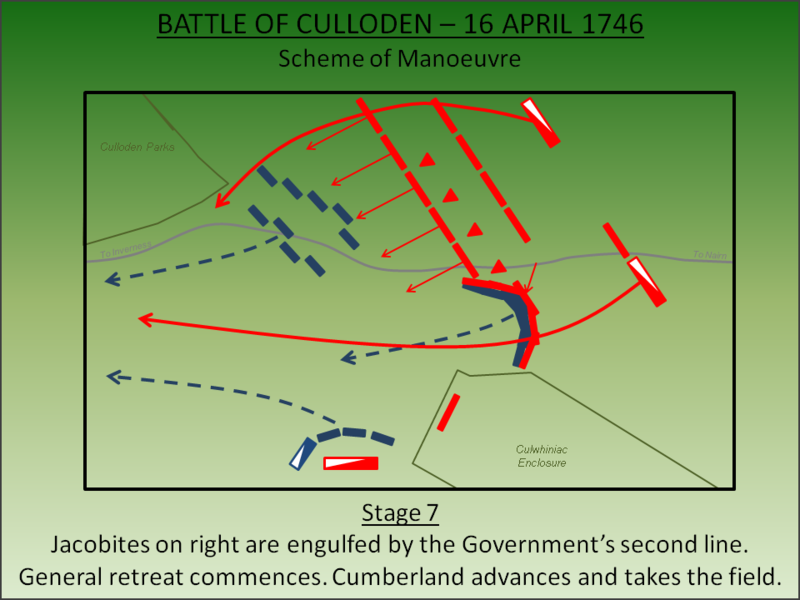 Whilst an attempt to engage the Jacobites at the Second Battle of Falkirk (1746) led to a Governmental defeat, their forces were able to withdraw to Edinburgh without significant loss and soon augmented Cumberland’s force. The Jacobites retreated further north into their Highland strongholds aiming to dislodge the Government garrisons along the Great Glen and renew the campaign in the Spring. Inverness Castle (Fort George) and Fort Augustus both fell at this time. The Jacobites wintered in Inverness whilst the Government forces did the same at Aberdeen. On 8 April 1746 the Government forces under Prince William Augustus, Duke of Cumberland moved out of Aberdeen ready to renew the war. Well equipped and supplied they arrived at Nairn, just 12 miles from Prince Charles at Inverness, on 14 April. 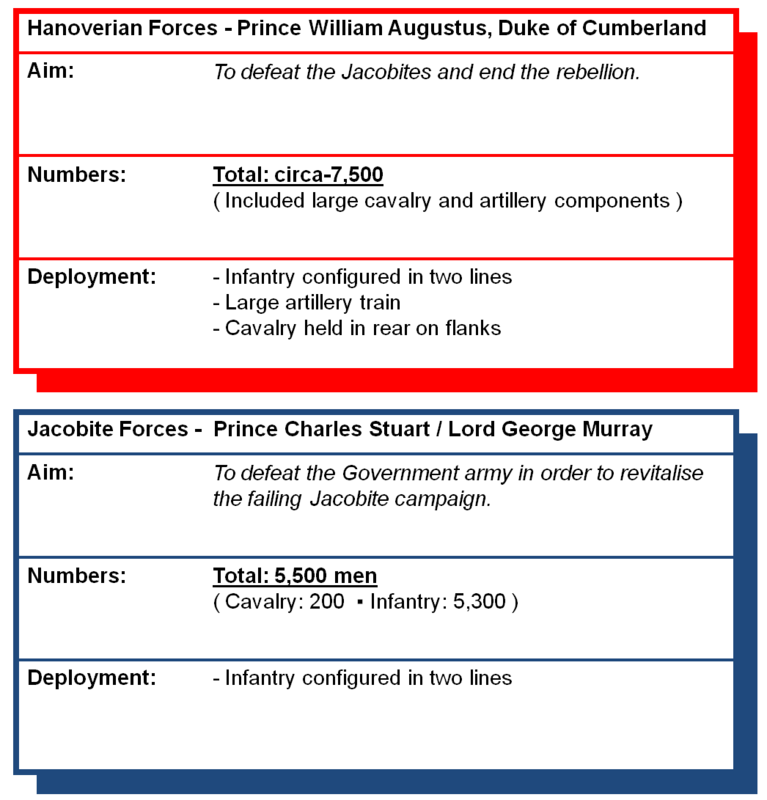 By contrast the Jacobite army was in a poor state; a Royal Navy blockade had left Prince Charles without money or supplies meaning he needed to initiate battle quickly in order to remain in the field. The Prince announced his intention to invite a battle on the high ground to the south of his headquarters. 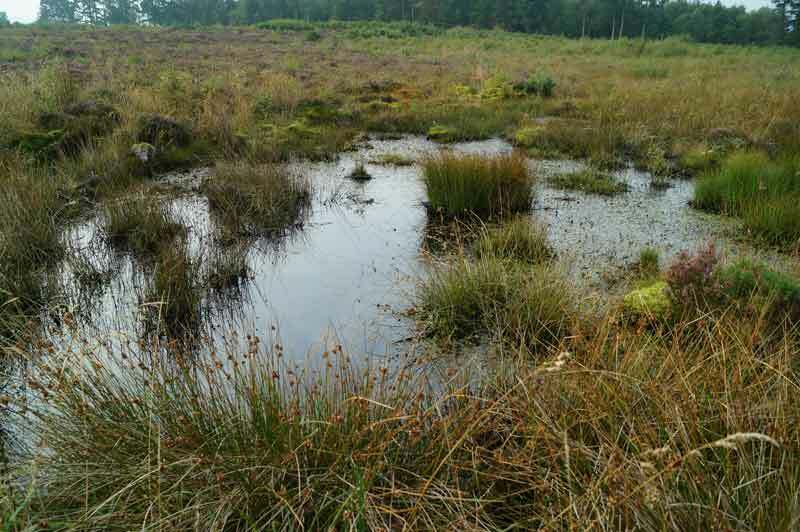 This area, known as Drummossie Moor, was open terrain but very boggy. Murray vigorously opposed the site considering it unsuitable for the Highland charge and instead proposed a nearby alternative. He was overruled and on 15 April 1746 the Jacobites formed up on Drummossie Moor hoping to fight Cumberland that day. However the Government army remained in Nairn. Murray now proposed a night attack. This got underway but required the Jacobites to traverse difficult terrain and was called off when they failed to cover sufficient distance before dawn. The Jacobite army returned to the Moor exhausted perhaps hopeful that the Government army would spend another day in Nairn. However, by mid-morning Cumberland's forces were advancing to meet the Prince on his chosen terrain. The Jacobite army was significantly outnumbered but Prince Charles had placed his faith in the Highland charge. The outcome of the battle hinged upon the successful initiation of a single charge across the entire line to break the Government line. The Jacobites drew up between two stone walled enclosures; Culloden Parks on their left and Culwhiniac enclosure on the right. However, the Prince lacked sufficient men to occupy these areas and accordingly they were left empty. The Duke of Cumberland drew up his force opposite configured in two lines. 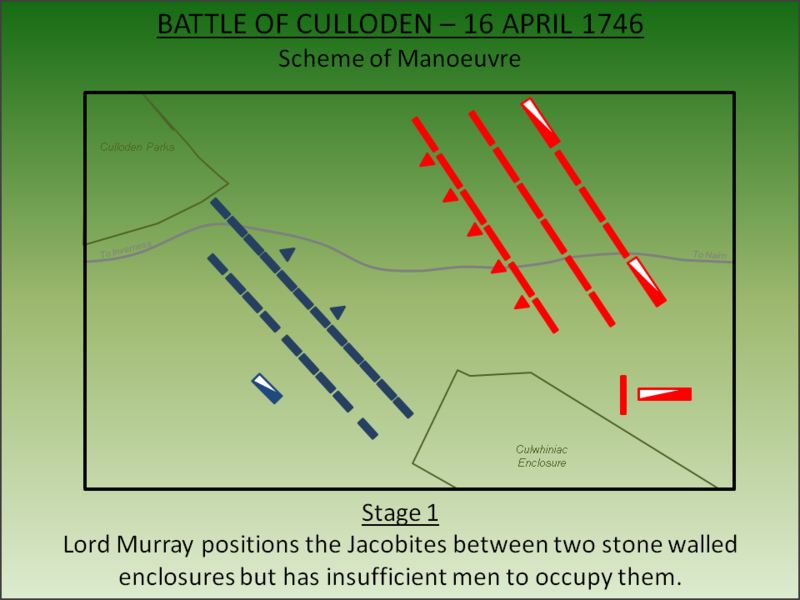 The Jacobites commenced the battle with an artillery assault on the Government lines but, with just 12 pieces, their attack was ineffectual. Cumberland responded to the Jacobite bombardment with the full might of his assembled artillery and mortars. 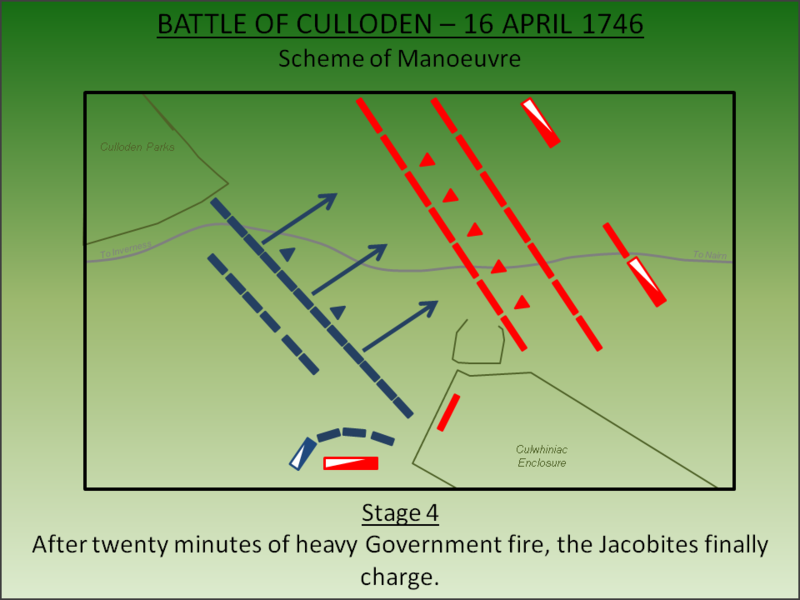 The concentration of fire from the Government batteries caused extensive casualties amongst the Jacobites but who nevertheless held their position waiting for the order to advance. Concurrently a detachment of Government Dragoons broke into the Culwhiniac enclosure enabling them to fire directly on the Jacobite lines further increasing casualties. After remaining stationary under fire for nearly twenty minutes, the Jacobites finally charged. When deployed correctly the Highland charge was a formidable tactic relying on a fast advance against the entire width of the enemy frontline to ensure only one or two volleys of musket fire could be delivered by the opponents. At close range the Highlanders would fire their own muskets, discard them and then smash into the enemy line using formidable close range weapons including dirks, broadswords and axes. Unfortunately for the Prince, as Murray had advised, Drummossie Moor was unsuited to the Highland charge. On the Jacobite left the boggy ground defused the fast advance to a slow wade through knee deep mud and water. In the centre the line of advancing Jacobites slewed right as the attackers sought firmer ground but this brought them into line behind their own right wing which blocked their own fire. 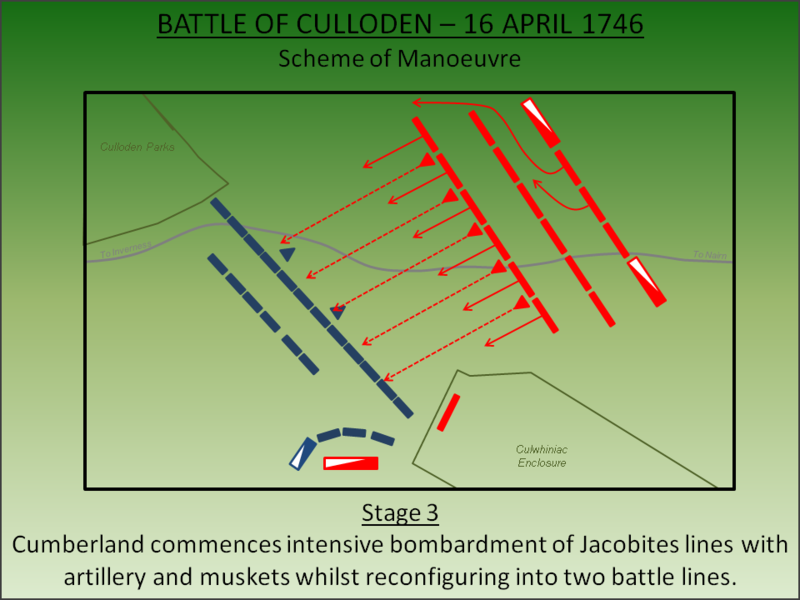 Only on the Jacobite right did the charge go as planned but when they arrived at the Government frontline they found that the breadth of their attack was insufficient to stop them being engulfed. Under fierce fire the Jacobite right broke and fled whilst the left was still slowly advancing. Cumberland now launched his dragoons and cavalry into the fray. The Jacobites were routed with around 1,200 killed and a similar number wounded. Cumberland ordered his infantry to advance and take the field having sustained fewer than 50 killed plus around 300 wounded. 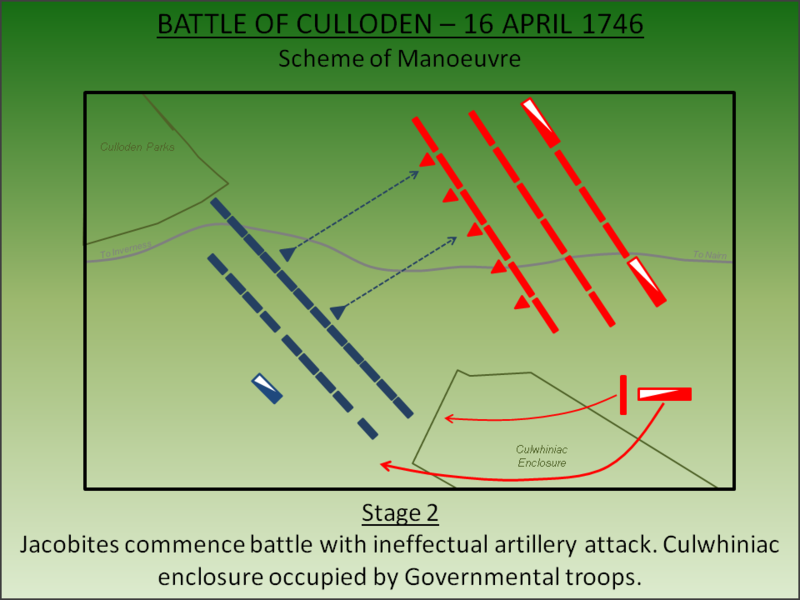 The defeat at Culloden was a mortal blow to the Prince's rebellion which saw him lose the will to fight. Whilst Murray marshalled the surviving Jacobites at Ruthven ready for the next stage of the campaign, Prince Charles simply ordered "Let every man seek his own safety in the best way he can". The Prince spent the next four months as a fugitive but was eventually successful at fleeing abroad. For the Highlanders a period of Government revenge followed as Cumberland’s forces rampaged through their territories intent on inflicting a lesson that would be remembered for generations and which earned him the title ‘Butcher Cumberland’. Of the 3,471 prisoners taken during the battle and the subsequent round-up almost one thousand were shipped as slaves to America or the West Indies whilst 120 were executed. Given the relative ease with which Inverness Castle had fallen to the rebels, the mighty Fort George citadel was built as a replacement (completed in 1769). Perhaps the most significant outcome of the battle was the direct assault on Highland culture. Tartan was banned (outside of the British Army) as were bagpipes. The Disarming Act (1746) made carrying weapons illegal whilst the Heritable Jurisdictions Act (1747) stripped Clan chiefs of their legal powers. Whilst these harsh measures were eventually repealed in the 1780s, the impact when coupled with wider economic and social changes ultimately led to the Highland Clearances and an irreversible change to life in the northern part of the British Isles. Jacobites. The bulk of the Jacobite force was drawn from Highland clans who were traditionally armed with muskets, broadsword and a small round shield. Their ‘Highland charge’ was a fast assault on the enemy position with them firing muskets at close range, dropping their firearm and then engaging with broadsword. 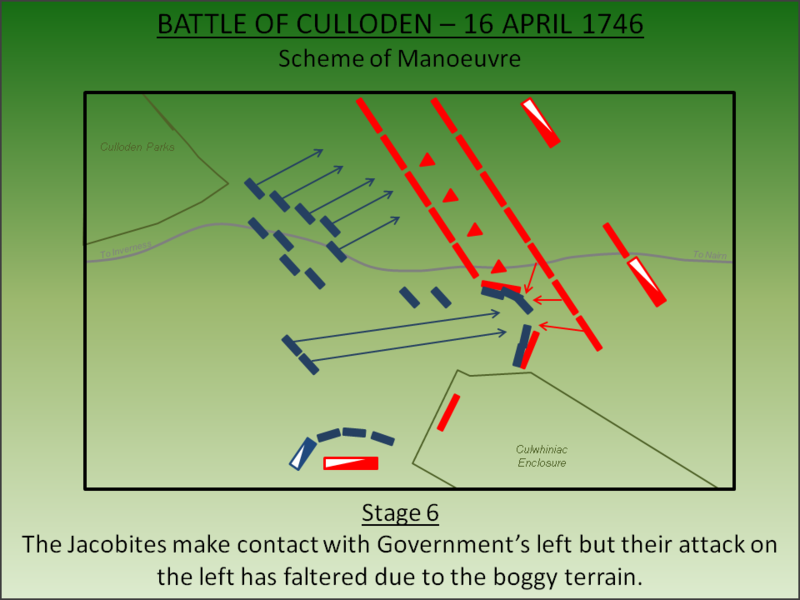 It was an effective tactic that worked well but went wrong at Culloden due to the boggy ground. Government Forces. The Royalist army at Culloden was a mix of Redcoats, loyalist Highlanders and Scottish lowlander regiments. The bulk of the force was armed with muskets that they traditionally fired in volleys rather than ‘aimed shots’. Bayonets were fitted prior to the battle starting and provided a close-quarters weapon system ideal for stabbing. Ang, T abd Pollard, M (1984). Walking the Scottish Highlands: General Wade’s Military Roads. Andre Deutsch Ltd, London. Douglas, D.C, Horn, D.B and Ransome, M (ed) (1975). English Historical Documents Vol 7 (1714-1783). Routledge, London. Lancaster, J.H.D (2014). 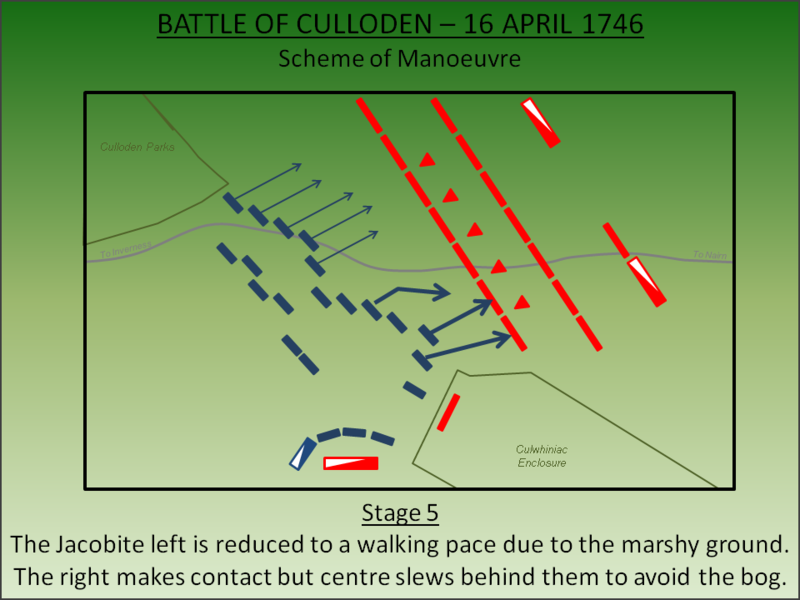 Culloden: Battlefield visit notes and observations. CastlesFortsBattles.co.uk. McCall, C (2003). Routes, Roads and Rebellions: A Brief History of the Life and Works of General George Wade. SOLCOL, Matlock. Maclean, F (1995). Highlanders: A History of the Highland Clans. Adelphi, London. Ordnance Survey (2015). Highland. 1:1250. Southampton. Reid, S (2004). Battles of the Scottish Lowlands, Battlefield Britain. Pen & Sword, Barnsley. The site remains largely undeveloped although is now partially woodland which reduces visibility of the battlefield plain. A monument marks the site of the battle and there is a major museum run by the National Trust for Scotland. Cairn. 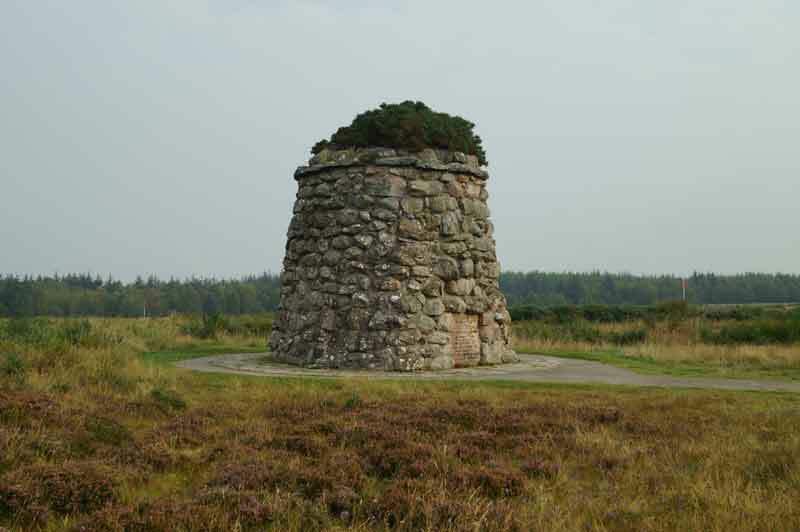 Both the clan stones and the large stone cairn were installed by Duncan Forbes, Laid of Culloden in 1881. By this time Victorian romanticism had created a nostalgia for the Jacobites. Partisan Plaque. 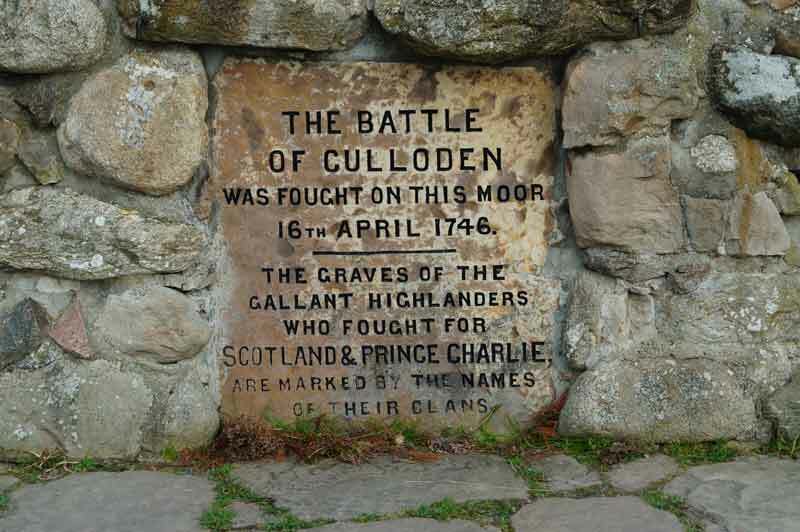 By the time the cairn was erected the battle had become seen as the English versus the Scots and this was reflected in the clan stones and the cairn. Waterlogged Ground. The battlefield’s boggy terrain defused the effectiveness of the Highlanders charge and was the single biggest factor in their defeat. Battlefield. Part of the battlefield is in the care of the National Trust for Scotland. 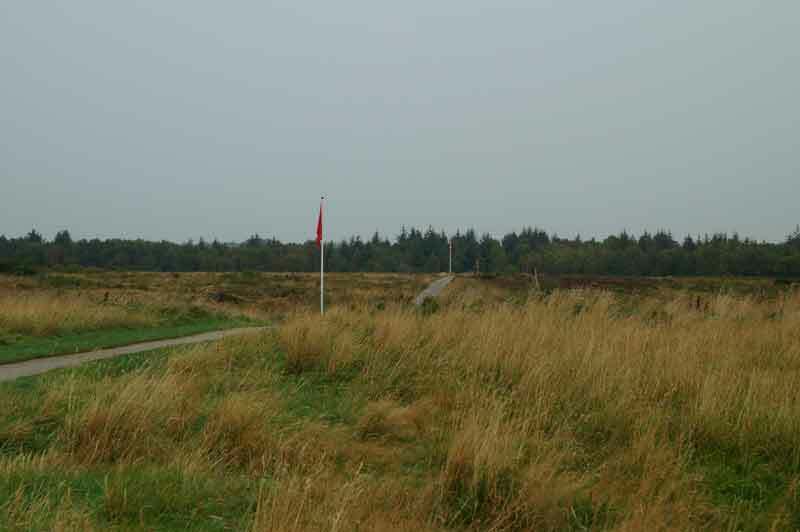 A series of paved footpaths cross the site with a good audio tour and flags marking the position of the forces. Clan Fraser. Charles Fraser of Inverallochie led Lord Lovat's Regiment within Lord Drummond's Division. Clan Campbell. John Campbell, Duke of Argyll led three companies of Highlanders against the Jacobites at Culloden. Clan MacKintosh. A Regiment from the Clan fought under Lord Drummond's Division. Clan MacGillivray. Alexander MacGillivray led Lady MacKintoish's Regiment within Lord Drummond's Division. Clan Cameron. From Lochiel, near Fort William. Fought with Lord George Murray's force on the Jacobite right. Clan Stewart. From Appin, near Oban. Fought with Lord George Murray's force on the Jacobite right taking 50% casualties. Clans MacLean and MacLachlan. Both fought as part of Lord Drummond's Division. Athol Highlanders. Raised by feudal levy and had little heart for the fight. Clan Donald. Three Regiments of MacDonalds fought for the Jacobites at Culloden - the MacDonalds of Clanranald, the MacDonalds of Keppoch and the the MacDonnells of Lochgarry. ‘Field of the English’. A somewhat partisan memorial stone. Actually significant numbers of Scottish forces fought on the Government side at Culloden. The battlefield is a major tourist attraction and well sign-posted. A dedicated car park (free for National Trust of Scotland / National Trust) members is on site.